Nowadays, you can’t seem to throw a pair of chopsticks across the street without hitting a sushi restaurant. But it wasn’t always thus. I remember when there was only a small handful of sushi restaurants in Utah. One of the most dependable—and the first to pave the sushi trail in Park City—was Peggi Whiting’s Ichiban Sushi. For 11 years, she and her husband, Clint, ran Park City’s Ichiban Sushi, garnering numerous awards and even making Zagat’s list of the Top 100 Restaurants in the United States. Ichiban became especially renowned for its annual Burn Off, where contestants ate round after round of sushi bathed in incendiary hot sauces. Then, the Whitings picked up and moved Ichiban Sushi to its current Salt Lake City location, housed in a historic former Lutheran church, previously occupied by Ristorante Della Fontana. Well, the Whitings are no longer involved with the day-to-day workings of Ichiban Sushi, although I was told that Peggi helps to supply some of the fresh fish for sushi used there. Since February, Executive Chef Thomas Ontko has been at the Ichiban helm, having moved to SLC from Jackson Hole, where he was lead sushi chef at the Four Seasons Resort. Ontko has also worked with high-profile notable chefs Toshio Tomita of Nobu and Daniel Boulud of Restaurant Daniel in New York City. So, how is this venerable Japanese restaurant holding up? Well, for starters, it is visually stunning. I’d forgotten how impressive the design of the place is, with its high-arching wooden ceiling, the upstairs tatami lofts, a custom-made 300-gallon saltwater fish tank, and clever combinations of stained glass (remember, this used to be a church), metal, iron and intelligent lighting schemes. But maybe my favorite design element is the wall to the left of the sushi bar, where regular customers can hang their favorite chopsticks, awaiting return visits. Visit Ichiban Sushi and one of your first encounters may be with the very talented general manager Tina Tippetts, formerly of Ruth’s Chris in Park City. She oversees a top-notch staff of servers and is likely to visit your table to make sure everyone’s happy and content. As you settle in to peruse the menu, you’ll notice something new to Ichiban: Chef Ontko has introduced an izakaya menu. Izakaya translates roughly as Japanese bar or pub food—a menu of tapas-like dishes originally intended to be consumed with sake or beer. Highlights of the Ichiban izakaya menu include a delicious, although not-so-Asian dish of grilled asparagus with blistered cherry tomatoes, a poached egg and miso vinaigrette ($8). Calamari ($9) with tempura batter was crispy and light, accompanied by wasabi aioli and citrus soy sauces. However, at least half the dish consisted of incendiary jalapeño pepper slices—too high a ratio. Indeed, I noticed jalapeños incorporated into a number of Ichiban dishes we ordered; someone in the kitchen is a bit heavy-handed with the jalapeños. Other good izakaya items included the cleverly presented fish & chips ($13), which are battered-and-fried black cod pieces served with sweet-potato fries, spilling out of an overturned Chinese restaurant takeout box. We also loved the housemade ramen ($12), with its slightly sweet teriyaki flavors: a big bowl of pulled pork, mushrooms, caramelized onions, perfectly cooked noodles, sumptuous broth and a poached egg atop for good measure. Indeed, my son Hank loved the Ichiban ramen so much, along with his favorite maki roll, that he proclaimed Ichiban to be his favorite Utah restaurant. The roll he so enjoyed, as did I, was the dynamo roll ($10): fresh tuna, avocado, cucumber, spicy aioli and unagi sauce, topped with a tiny dollop of Sriracha. One thing that makes the dynamo roll so appealing is its texture; after construction, it’s rolled in tempura “crunchies,” which gives it both an interesting taste and a crispy texture. The high quality and freshness of the fish at Ichiban is best represented by the nigiri and sashimi offerings. Most nigiri is $3 to $4 per piece, depending on the fish. We enjoyed fresh-as-can-be kanpachi, tai, escolar, saba, maguro and tombo tuna and couldn’t have been happier. One reason for our happiness was the good luck of drawing an excellent server on two consecutive visits, named Jana Van Brocklin. She not only knew the Ichiban food menu inside and out, but also was very helpful with beverage recommendations. For me, a big appeal of Japanese restaurants is contrast. For example, sashimi-style yuzu-cured hamachi with jalapeño slices and minced green onions ($15) was light and subtle, and reminded me of my favorite Nobu dishes. A 1-pound order of fiery barbecued ribs with a zippy black-bean sauce ($14) was bold and weighty—rib-sticking, in fact. And, with the exception of the aforementioned overuse of jalapeños, there was only one real miss during two extended forays through the Ichiban menu. One of the restaurant’s best dishes should be the grilled hamachi kama ($12), which is yellow- tail cheek and collar. This was a beautifully grilled, oh-so tender piece of fish, served on a bed of lemon slices. However, it was also over-salted. That’s a shame, given that the hamachi kama would have otherwise been the menu item I’d have recommended the highest. A little lighter on the salt, and this would have been one of the best fish dishes I’ve ever eaten. 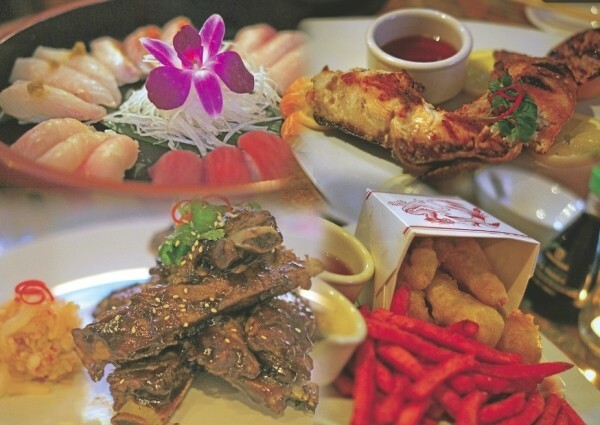 By my count, Ichiban Sushi—first in Park City and now in Salt Lake City—is well into its third decade. That’s a remarkable run by anyone’s standards, yet it just keeps getting better—an excellent eatery that doesn’t forget to renew itself.